ADP is the largest most established payroll processor in the United States. It supports businesses of all sizes. However, there are numerous ADP competitors and payroll alternatives, many of which offer similar services at much lower prices. Many of the ADP competitors are also easier to set up and use and may provide better customer support. *As a benchmark, we used an every-other-week payroll for 25 employees, which would likely cost more than $4,000 per year using ADP Run, ADP’s product geared toward small businesses. ADP is right for larger complex businesses due to its industry experience and ability to customize its software. However, the smallest of businesses and those running weekly payroll cycles may not have the need or budget for ADP. In addition, ADP is priced per payroll run and often costs double that of newer cloud-based payroll software. ADP offers full-service payroll and markets itself as “a more human resource.” As such, it provides all the payroll, and most of the human resources (HR) and benefits features your small business might need. Many of the ADP alternative payroll software programs — depending on add-ons they have — offer workers comp, integrate with HR systems, provide labor law posters, track time worked, manage vacation and paid time off (PTO) balances, and provide custom reports. As we review each of the ADP competitors, we’ll discuss these additional benefits and services. For a business with a staff of 25 employees running an every-other-week payroll, ADP Run would likely cost your business about $4,000 per year. However, prices are not posted on its website, and if you run weekly payroll, it’s likely to cost more. That’s because ADP is priced by payroll run, not by employee headcount like some of the newer online payroll software. For an accurate quote, you need to contact ADP and talk with a sales representative. One of the benefits of going with ADP from the get-go is that ADP can support your business as it grows. For example, once you get to 50 full-time-equivalent (FTE) employees, you’ll need to provide health insurance; ADP can provide that as can many of ADP’s competitors. ADP also can help you with new hire reporting, setting up workers’ compensation insurance and filing state and federal taxes. On the downside, ADP is more expensive, and upgrading from one tier to the next isn’t always seamless. 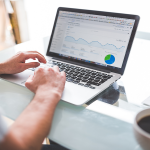 In addition, getting set up with ADP can take weeks, whereas many of the newer payroll software providers offer self-service setup to get you up and running in days. If you know your business is planning to grow well past 50 employees, or you’re already familiar with ADP, then it makes sense to stick with an industry expert. However, if you’re just starting out, or don’t imagine your business growing past a dozen or so employees, you may find one of the competitors to be a much better value. Many offer similar services at half the price. Contact ADP for a quote. Based on its low price, ease of use, great reviews, and robust features, Gusto is the best option for small businesses that want great payroll software without the ADP price tag. Gusto offers payroll in all 50 states, and it’s the same price whether you need to run payroll in one state or several, making it best for any business up to about 99 employees. Gusto provides tremendous flexibility including an employee portal and direct deposit for your staff. You can pay hourly workers, salaried workers, or independent contractor employees all from one system. It’s electronic filing, e-signatures, and state compliance allow you to run payroll worry free. Gusto, like ADP, takes care of new hire reporting, tax filings, and year-end reporting. Gusto offers an easy to set up payroll solution for small business. Gusto has all the features mentioned above even though it costs just half of what ADP costs. On top of that, Gusto provides basic HR functions like a co-worker directory and organizational chart, which ADP Run doesn’t have. So, in a way, you’re getting more for less. If you’re in one of the 24 states where Gusto provides benefits insurance, that’s a nice bonus to be able to offer to your employees. Gusto costs $39 per month plus $6 per user per month. For our comparative pricing, using a company with 25 employees paid every other week as an example, Gusto would cost $189 per month. By comparison, ADP Run, which charges per payroll, would cost more than $300 per month. Best of all, there is no annual contract and no setup fee with Gusto. ADP charges a $200 setup fee and requires you to commit to at least one year. On an annual basis, Gusto would cost about half as much as ADP, and there is no additional cost if you have employees in multiple states. Unlike ADP, which charges for every payroll run, including if you have to re-run a payroll due to an error, Gusto’s rate is based on the number of employees each month, not the number of payroll runs, ensuring your payroll costs remain predictable. Gusto provides payroll as part of an HR and payroll software package. So in addition to payroll processing, you also get basic HR functionality, such as employee data and paid time off (PTO) tracking, at no extra charge. Workers’ compensation administration, W-2s, and 1099s are also included in this price. With ADP Run, you can’t shop around for workers comp, and you have to pay extra for year-end tax documents. That adds up. Gusto is missing customer support on the weekend, although its support gets good reviews for solving any issues, and it won’t print and mail checks for you as you can print checks once you complete your payroll run. Unlike ADP, Gusto does not offer labor law posters, but that’s not a huge downside because you can download them for free from the U.S. Department of Labor (DOL) or Gusto’s website. Both ADP and Gusto can process garnishments ― money taken out of wages for certain legal reasons, such as a court order to pay child support ― but Gusto doesn’t manage garnishments in South Carolina. Although Gusto’s online reviews are mostly positive, there are some naysayers ― especially companies that grow past 100 employees and feel Gusto lacks customization options. For more information, check out our Gusto review. Gusto offers a one-month free trial that starts with your first payroll run. Gusto continues to be our top pick for small business payroll software due to its ease of set up and use. In fact, you can typically set it up on one day using its step-by-step process. Try Gusto free for 30-days. If you’re using Square for payment processing in your retail or restaurant establishment, you may want to give its payroll software a look. In addition to payroll, it can manage timekeeping and scheduling ― keeping all of your data in one app. Therefore, it’s a great option if you’re a small business already using Square for your point-of-sale (POS) system. 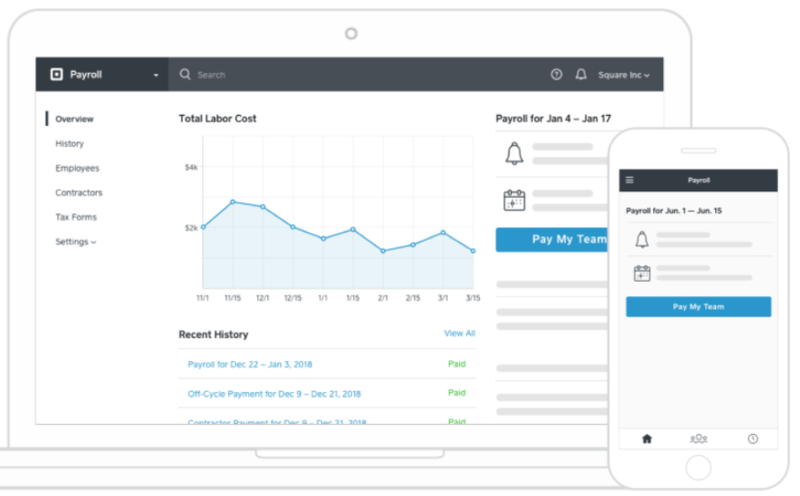 Square Payroll is a newer software, best saved for smaller businesses that need to pay either employees or contract workers. While it doesn’t have the HR features of Gusto, ADP, or Paychex, such as online I-9 document storage or health insurance offerings, as a payroll solution, it’s priced right for small business. Square Payroll can be used to pay employees and contractors. Square Payroll costs less than half the price of ADP. Square Payroll costs only $29 per month plus $5 per month, per person translating to about $1,850 per year instead of about $4,000 with ADP. In fact, if you pay only contract workers, not employees, the cost is $5 per month, per contractors with no monthly fee. In addition, it has the benefit of time and attendance included at no extra charge. Square Payroll offers all the standard payroll processing features a small employer would need, such as the ability to pay both employees and contractors using checks or direct deposit. It provides online accounts so that employees can view their own paychecks and tax forms, and it provides state-mandated new hire reporting and tax filings at no extra cost. The one thing missing from Square Payroll is that it doesn’t support household or agricultural employers. It also doesn’t include local tax rates, which you’ll have to determine and input manually, along with any other deductions, such as for health benefits or 401(k). Square is also less configurable than ADP or Gusto when it comes to payroll timeframes, a factor to consider if you’re wanting specific pay period start and end dates. Square Payroll earns mixed reviews in the 3 to 5 out of 5-star range. Users like that it includes nice features like tip calculations and online employee accounts, but it lacks benefits and retirement plans that are available with ADP, Gusto, and Paychex. See our complete Square Payroll review for more insight. To start using Square Payroll, you can add it in your Square online dashboard. If you want to add both Square and Square payroll, you can do that directly from its website. Get started for free. One of the cool benefits of Paychex Payroll is the ability to run payroll from your mobile app. Neither ADP Run nor Gusto does that. 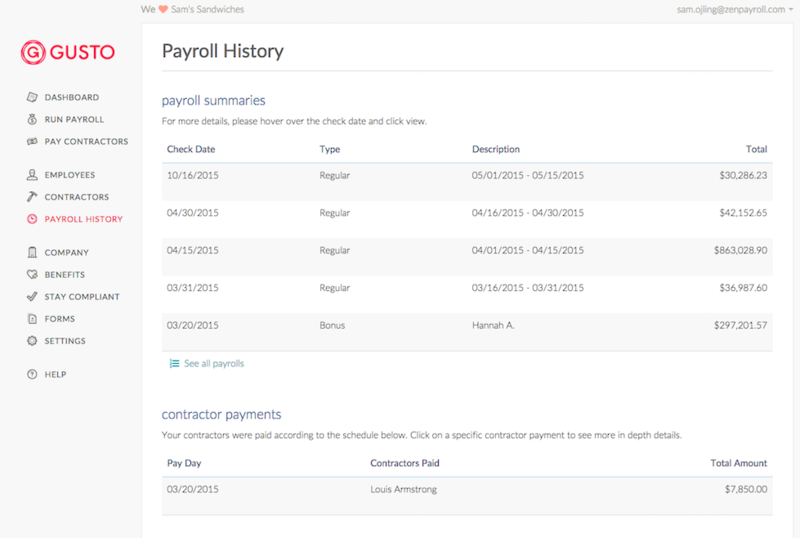 When you run payroll, it runs reports for you, so they’re ready to view right away. You don’t have to run them yourself or wait while they process. That saves time. 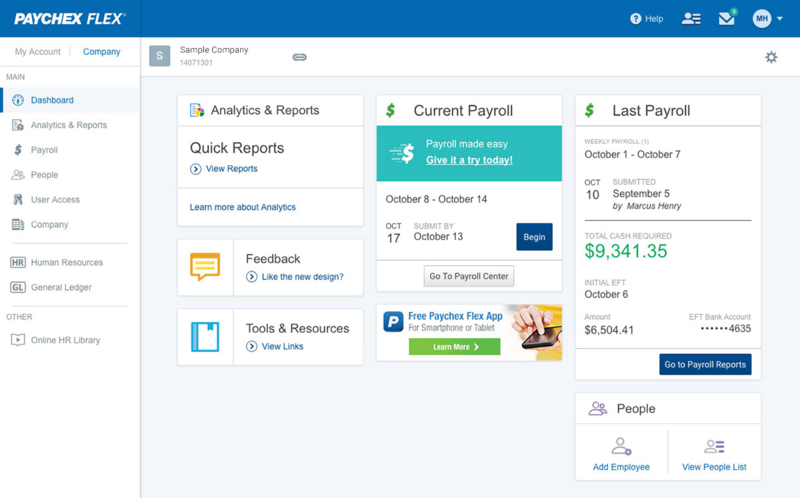 Paychex Payroll offers similar features to ADP and Gusto, including basic HR data, like hire data and employee contact info, mobile access to paystubs, tracking of balances like 401(k), ability to put an employee on leave, and ACA compliance. Paychex Flex is Paychex’ small business payroll solution. Paychex Payroll also offers something called “open API,” which allows software developers (or your internal programmers) to integrate payroll data with your custom or proprietary software. Like ADP Run, Paychex bases its pricing on the number of payroll runs, so in our example of a company with 25 employees and every other week payroll, the price would be about $217 per month for 26 pay runs a year. That ends up being cheaper than ADP in our 25 employee comparison as shown below ― and there’s no setup fee. However, there are multiple pricing tiers and small upcharges, such as $10 for payroll delivery. Paychex Payroll, like Gusto, is nearly half the cost of ADP Run. For other Paychex pricing tiers, read our review of Paychex Payroll. We used pricing from Paychex Flex Pro which is most similar to ADP Run, but you could also get an option that has timekeeping functionality for about $1 a month more per employee if you need both timekeeping and payroll. ADP Run also has a timekeeping option at $2.60 per person, per payroll run ― more than double the price of Paychex. In comparison, Gusto’s timekeeping is accomplished with an interface to Homebase software ― free for unlimited employees in one location. Like ADP, Paychex Payroll runs payroll, and you can purchase add-ons such as timekeeping, and HR applications that allow it to function like an all-in-one package, similar to Gusto. Paychex Payroll includes pre-employment background screenings and an employee handbook builder in its offering that ADP doesn’t have. Paychex also includes labor posters. ADP charges extra for posters and Gusto provides a link to government websites where you can download them for free. Paychex also offers an employee portal for self-service so employees can do things like updating their tax withholdings, and employees can use a mobile app to view pay stubs. These are time savers that mean you don’t have to do as much payroll administration work yourself. The biggest things missing with Paychex Payroll are integrations to external timekeeping and accounting software ― as it has its own packages for an additional cost. As far as pricing, it’s much less than ADP but still higher than Gusto. Like ADP, it charges extra for year-end W2s, whereas Gusto includes W2s and 1099s at no extra charge. Paychex Payroll has mixed reviews. On the plus side, business users like the software and tax compliance. However, some find its sales team pushy, customer service inconsistent, and fees annoying. For a side-by-side comparison of these top three ADP competitors, check out our robust comparison of ADP, Paychex, and Gusto to see how similar they are. Like ADP, Paychex Payroll doesn’t provide pricing online, and therefore, you’ll need to contact them for pricing. It’s best to understand your exact payroll processing requirements in advance before you set up an appointment for a demo and sales pitch. Paycor Perform provides the basic payroll functions along with employee data administration and can scale up to 10,000 employees. Employees can view their pay stubs via mobile phone. But Paycor, like many of the ADP alternatives, offers much more in its packages, such as PTO and vacation tracking, workflow, and communication tools. Like Gusto, Paycor is one of the easiest payroll platforms to get started on. Once you decide to use it, you can be set up in days and will have a dedicated customer support team to answer questions. Inova, which offers similar features, requires a 4-6 week set up time frame ― similar to Paychex and ADP. Paycor provides all in one payroll with an HR dashboard. Paycor also has an interface that uses widgets (boxes on the screen) for commonly used functions, like the company communication option. That allows you to send out reminders to employees about payroll, or any topic, such as next month’s holiday schedule. Paycor starts at $49 per month for up to 10 employees and works out to about $188 per month for 25 employees if you run payroll every other week. In our example of 25 employees, it would run $2,664 vs more than $4,000 for ADP. However, that price includes year-end tax processing ― whereas ADP and Intuit charge extra for that. Like ADP, your price will go up if you process payroll more often. Adding functions, such as ACA compliance when you get to 50 employees, is also not expensive with Paycor at only about $2 per employee. Time and attendance cost extra ― about $3 per month plus a setup fee. Paycor also has a more entry-level payroll system which we didn’t compare. Since its pricing isn’t available on its website, you’ll need to contact them directly for that option. Features like HR Analytics and Recruiting can be added as your business grows. Paycor payroll is built on its Perform HRIS platform and that means you can add functionality as your business grows. It has clients of all size from one to 10,000 employees, so you won’t have to change payroll companies if you grow past 100 employees and realize you want to add features like a new hire onboarding checklist, applicant tracking or training tools. It also provides software integrations to systems like QuickBooks and more. In addition to payroll, Paycor has lots of add-ons, such as managing PTO and vacation balances, workflow that reminds you to do things like add a bonus, and customizable views. Its payroll data displays on a pay grid, which looks like a spreadsheet on steroids and allows you to view all data at once, exactly as you want to see it including base pay, overtime commissions, and so on. Once payroll runs, the reports provide visual data with color charts. Paycor was difficult to get in touch with via web and email. After completing the online form for a quote, and viewing a demo, we received daily system-generated marketing emails that felt spammy. However, we never received a personal response via phone or email until we called and asked for the sales department. Paycor earns solid reviews on third party websites including ours. What users like is the integration and the fact that the platform grows as their business grows. Its chat feature lets you provide software feedback directly on its website. It uses customer feedback to determine their software improvement priorities. Once you contact Paycor, it sets you up with a quick 30-minute demo and gives you pricing right away. It doesn’t offer a free trial as the setup is unique to each employer. Therefore, if you want a quote, it’s best to contact them directly. Go to Paycor’s website. Intuit Basic Payroll is designed for anyone using QuickBooks. Both products are made by Intuit, and Intuit Payroll integrates with QuickBooks for general ledger and taxes. 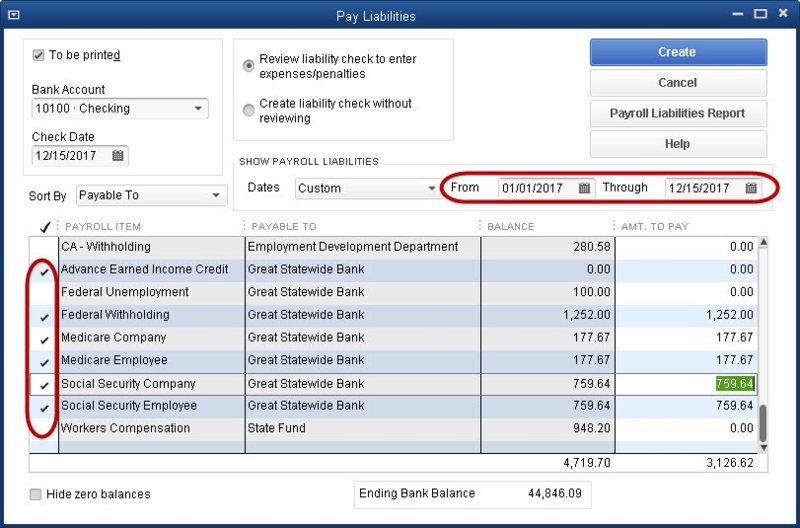 If you’re already using QuickBooks, Intuit Basic Payroll can be a quick and easy payroll solution. Intuit Payroll is also great for anyone who wants to be able to run payroll even while out of the office since you can run payroll from your laptop, iPad, or even your smartphone, similar to Paychex Payroll. While you don’t need QuickBooks to run the cloud-based Intuit Basic Payroll, you’ll find it saves you time by avoiding duplicate data entry if you have both Intuit applications ― Intuit Basic Payroll is compatible with QuickBooks Online or a 2015 or newer version of QuickBooks Desktop. Therefore it’s a solid option for existing users of QuickBooks software. Intuit Payroll integrates seamlessly with QuickBooks accounting software. Intuit Basic Payroll pricing starts at $290 per year with an additional $2 per employee per month if you pay annually. On the surface, Intuit Basic Payroll appears to cost significantly less than ADP Run at $890 per year for 25 employees vs $4,000 year with ADP Run or any of the ADP competitors. However, the way that Intuit Basic payroll is priced, fees start adding up if you add worker’s compensation, direct deposit, and year-end tax processing. Notice all the features that aren’t included in the Intuit Basic Payroll base price. For example, direct deposit alone would cost $1,300 bringing the total to $2,190 per year, without all the features that a vendor like Gusto provides. However, unlike ADP, there is no charge per payroll run, and you can even run salaried and hourly payrolls on different pay dates ― for example, you may wish to pay hourly staff weekly, and pay salaried employees every other week. If you run weekly payroll and print your own paper checks, Intuit Basic Payroll might be the best value. You can upgrade to get additional features like timekeeping when you need them. Learn more about Intuit’s different pricing tiers here. Intuit Basic Payroll has versions that run with or without QuickBooks. You input your payroll hours and run payroll. Employees can be paid via check, pay card like a credit card to pay employees without bank accounts, or direct deposit, and they can view their pay stub online via smartphone. However, you’ll pay a fee for each direct deposit. Like ADP, Intuit also provides Labor Law posters, workers comp, and 1099s for an upcharge. If you’re interested in adding payroll to your QuickBooks about, we provide a guide on how to set up QuickBooks payroll. You have to upgrade or pay extra with Intuit Basic Payroll to get automated year-end tax forms. However, the data is provided so you can give year-end payroll and tax data directly to your tax accountant. Like ADP, Intuit also has no access to benefits providers and can manage only the benefits deduction, not enrollment. Intuit also doesn’t have ACA compliance, so as you grow past 50 employees, it might not be the best option. However, given the overall annual savings and QuickBooks compatibility, Intuit may still be the right ADP alternative for you if you plan to print and distribute paper checks manually. For an in-depth review of how Intuit payroll compares to Gusto and others, read our payroll buyers guide. Intuit payroll receives solid user reviews. However, it gets a good share of complaints as well. The biggest issue current users report is the fee charged for each direct deposit. In addition to that, some users feel that its customer support takes too long. 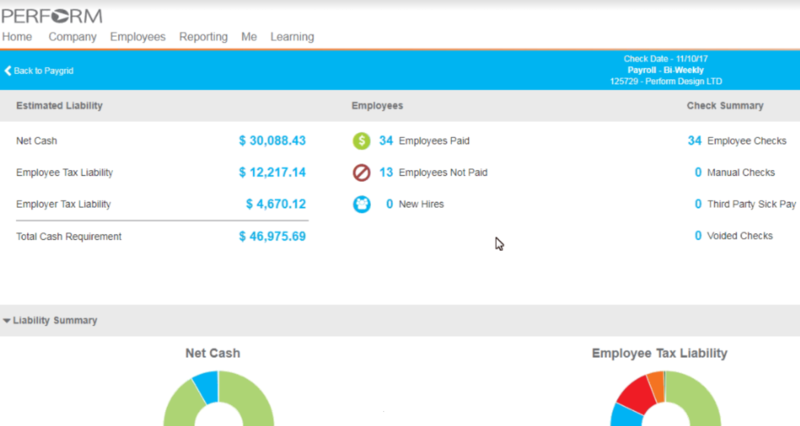 Check out our Intuit Payroll Software review. Also, ask about specials. At the time this was written, Intuit was offering the first month free. Also, if you buy QuickBooks and Intuit QuickBooks Payroll at the same time, you can save 50% off both. Try Intuit Payroll. Zenefits is HRIS software that includes payroll. It’s designed for those businesses looking for more HR options such as hiring, onboarding, company directory, and org chart, which are not available with ADP Run. However, if you’re planning on adding HR tools anyhow, then you could do so with Zenefits getting both HR and payroll for less than the cost of ADP. 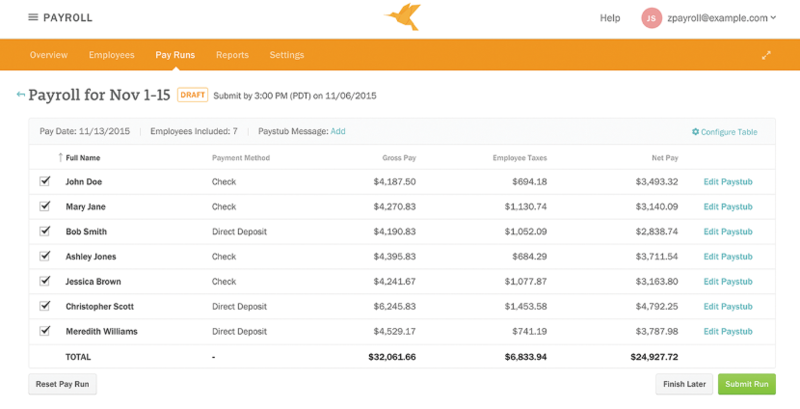 Zenefits offers payroll process as part of its HRIS software. Zenefits is best for any organization that wants to make its benefits process front and center. It includes health insurance and other benefits as well as HR processes. Some of the other ADP alternatives like Paycor and Inova have an upcharge for its benefits and HR features. Zenefits costs $40 per month plus $5 per employee per month for its HR software, and another $6 per employee per month to add payroll, making them a bit more costly than solutions like Gusto or Paycor ― albeit still less than ADP. In our example using 25 employees, Zenefits would cost slightly less than $4,000, while ADP would be over that amount. Because it prices its offerings based on monthly rates rather than per pay run like ADP and Paycor, Zenefits may be less expensive for payroll if you run payroll weekly. However, there is an extra cost of $2 per check to pay contractors and vendors. If you pay for an annual contract, you can obtain up to 25% off. Even without the discount, the cost of Zenefits would be $315 per month for 25 employees paid every other week to get HR and payroll, compared to ADP which would cost about $330 for payroll alone. Zenefits provides a demo and a free trial, so you can evaluate the software before you commit. We recently wrote an article reviewing Zenefits, and another on Zenefits competitors in the HR/Payroll market. With employee HR and payroll integrated, all your employee data is in one place, so there’s no need for duplicate data entry, saving you time and reducing mistakes. While Zenefits tracks garnishment deductions, it doesn’t remit them to a third party, so you’ll have to do (and track) that manually. One of our reviewers said the time-off request function in Zenefits was clunky as compared to ADP. If you pay employees via commissions only, Zenefits can’t help. Also, Zenefits currently doesn’t offer payroll processing in all 50 states, whereas ADP and most of the ADP alternatives do. Small business owners don’t rate Zenefits as highly as they rate Gusto or Paycor for payroll processing. However, those looking for an HR and benefits solution primarily find it nice to have all-in-one integration, including tools like performance management for $4 per month per employee extra. Read our Zenefits user reviews for additional insight. Zenefits provides a demo you can view before talking with a salesperson. This is a great way to familiarize yourself with the tool before you set up a sales call. Like ADP and Paychex, you’ll want to have your requirements defined in advance to avoid being pressured into purchasing features your small business may not yet need. 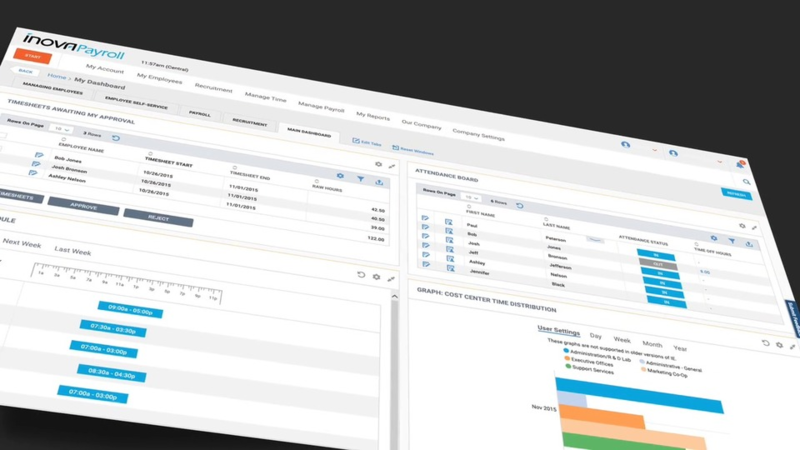 View a Zenefits demo. Inova is another ADP alternative that’s rated highly by users and affordable for small business. It’s a good choice for companies experiencing growth or expansion as you only pay for what you need until your employee population requires you to bump up to the next tier with additional compliance features for employers of that size, such as ACA compliance at 50 FTE or EEO reporting at 100 employees. Inova provides HR functionality like Gusto, and also adds I-9 verification through E-Verify which is a benefit in regulated industries like health care. In time, with Inova, you can add everything a large scale enterprise HRIS provider might offer ― similar to Paycor. Inova was designed with specific industries in mind. For example, it integrates with POS systems for retail and hospitality, which ADP Run doesn’t do. 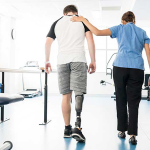 Like ADP, Inova can manage the robust payroll requirements within the healthcare industry, such as shift differential pay. Inova bases its pricing per pay run and per check, similar to ADP. For our comparison of 25 employees with every-other-week payroll, Inova averaged under $200 per month for payroll. Inova also offers a discount for non-profit organizations. However, its pricing isn’t online and varies significantly based on the services you sign up for. But, there’s a catch. The annual payroll processing price doesn’t include tax payments, and for those, you’ll pay about $300 extra per state that your employees work in. That’s great if all your employees are in only one state. It can be expensive if your employees are in five or more states, adding $1,500 per year ― $300 per state ― to your payroll costs. Like ADP Run, Inova is cloud-based but is more like Paychex Payroll with cool benefits such as a mobile app for employee self-service. Inova provides automated new hire reporting and unlimited deductions. It also processes payroll calculations real-time (you don’t have to run a process to see and verify the net check amount). Inova had one of the best reporting options out of all the ADP competitors we tested. All its standard payroll reports are customizable on the fly, and report data can be downloaded in a dozen formats ― from .xls to .html. Wage garnishments, such as child support, are managed through a third party provider. Most of the other payroll providers calculate the deduction and make the payment directly. This could create a hassle if you have to track down a missing payment and may even create a liability of payments aren’t done correctly. Its prices are not posted on the website, so you’re required to sit through a 90-minute demo before it’ll share pricing with you. Its tax processing fees go up based on the number of states you have employees in; that can get costly if you have multiple employees nationwide. Inova earns solid four and five out of five-star reviews on third-party websites. However, we have received few reviews from small business owners, which may be due to the fact that Inova pricing isn’t online, or that small businesses haven’t yet discovered it. Check out our review of Inova payroll. Inova requires that you contact them for pricing. Once you make that contact, it’ll provide a demo and pricing proposal. At that point, it will take a few weeks to get your software set up, as compared to services like Gusto that can be set up immediately. Contact Inova for a quote. In addition to direct competitors of ADP, your small business has options like free payroll providers or payroll calculators that may be missing some of ADP’s features ― to a professional employer organization, professional employer organization (PEO) that can provide full-service co-employment for your business. PEOs, such as ADP Total Source and Justworks can provide full-service HR, benefits, and payroll for a monthly per-employee fee that starts at less than $100 per month per employee. PEOs require you to complete an application process as it wants to ensure your business is in compliance with federal and state labor laws. Once you’re approved, it can serve as a co-employer taking on employment liability. The benefit of a PEO is that you can offer your employees the experience of working with a much larger employer ― providing insurance, 401(k) and larger employer benefits at less cost than you may be able to negotiate on your own. ADP Total Source is a good PEO alternative to ADP Payroll. A very small employer (with under three employees or a few seasonal hires) may want to consider the option of managing payroll with a free payroll provider. Typically, free payroll software won’t manage your new hire reporting to the state or file payroll taxes for you. However, if you’re already managing your own accounting and tax filing, you may find a free payroll software program to be an inexpensive way to provide paychecks to employees. All of the ADP competitors we described above cost less than ADP Run, which is ADP’s small business package. So, although ADP has the largest share of the payroll market, it’s not the only option. While some of the ADP alternatives, like Gusto and Paychex, offer similar services, others like Zenefits, Inova and Paycor offer a full HR suite. Before you sign an annual contract with ADP, take a look at the competition out there. You may find payroll software you like better such as Gusto, which does more at half the cost ― saving you money. Gusto offers a free 30-day trial. Try Gusto.